Summer is here and the time is right to cook outdoors. Cooking inside can heat up your entire house, even if you’re just using the stove. That delicious meal you want to cook has now turned into making the rest of your home a sauna. Don’t meddle in a hot house all summer, it’s time to cook outside with an outdoor kitchen. An outdoor kitchen is a great return on an investment, makes your yard more enjoyable and is a great for parties or every day cooking. You may be dreaming of that ideal outdoor kitchen, but what should you have in your amazing new living space? The heart of your kitchen is the stove or grill. It’s great way to start your plans for an outdoor kitchen with the cooking element. A great grill combined with a four-burner stove can maximize your cooking space. You can cook those amazing steaks on the grill while sautéing those delicious summer vegetables on the stove. Having both a grill and a stove are a great way to balance your outdoor kitchen. You want to maximize usage. Just a grill or just a stove can limit you but having both will make you want to use it every day. After you’ve decided on your heating elements, now let’s shift gears to the counter space. Having these fantastic places to cook is great, but you also need a place to prep food and store tools. There’s nothing worse than having to run back and forth from the house to the grill. Stainless steel drawers and cabinets are a great way to add style and sturdy storage that can handle the outdoor elements. Granite counter tops not only look great, but they hold up well and are easy to keep clean. When you are planning that outdoor kitchen, you are going to want to add plenty of counter space for prep and cooking, as well as a beautiful sink. No kitchen is complete without appliances. Pair stainless steel outdoor refrigerator with your stainless-steel cabinets for a great cohesive look. You can go beyond the fridge by adding extra features like a built-in trash can, drop-in cooler, and keg station. You can even add a wine fridge. Your outdoor kitchen is only limited by your imagination. An outdoor smoker is a great feature to add into your outdoor kitchen. Smoked brisket, chicken, pork, elk, or any other food you desire can become the hit of your meal and your party. If smoked meat isn’t your style, a pizza oven may be. Your home can be the fun home for your kids and their friends with an outdoor pizza oven. Nothing brings people together like pizza. Combine a fire pit with your pizza oven for a fun filled evening of pizza and togetherness. 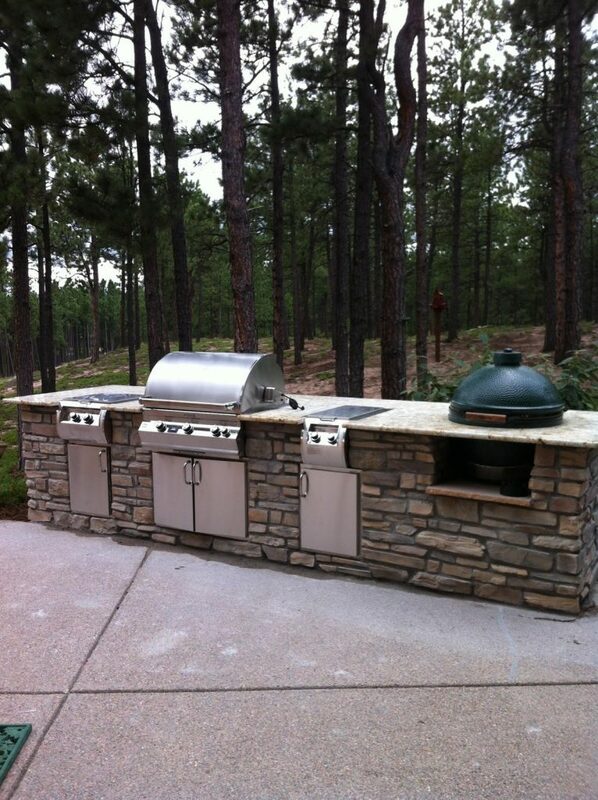 If you’re ready for that dream outdoor kitchen, we can help make it a reality. Contact us today so you can enjoy your outdoor kitchen this summer.